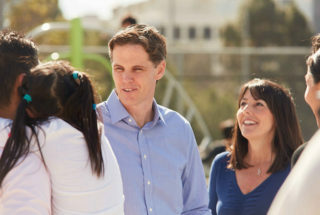 Marshall Tuck is one of four candidates running for state Superintendent of Public Instruction. He spent two years as educator-in-residence at the New Teacher Center, from 2015 to 2017. The Santa Cruz-based nonprofit seeks to improve student learning by accelerating the effectiveness of new teachers, experienced teachers, and school leaders. Previously, he led Green Dot Public Schools, a network of independent charter schools in Los Angeles, and Partnership for Los Angeles Schools, a turnaround organization that oversees 18 schools serving 15,000 students. Tuck still serves on the board of the Partnership. He was born in the Bay Area and graduated from UCLA and Harvard Business School. He lives in Los Angeles with his wife and son. This is Tuck’s second try for the state superintendent job. He narrowly lost to Tom Torlakson in 2014. He is 44 and a Democrat. The top two vote-getters in the June 5 primary will advance to November’s general election. Read more on the election here, and come back to LA School Report this week for interviews with the other three candidates. LA School Report sat down with Tuck to talk about schools, leadership, parent engagement, and more. The interview has been lightly edited. How do you define a high-quality school? I think of it these days through the eyes of my 6-year-old son. He’s in kindergarten. Is it a school that, first and foremost, really is positive and optimistic for kids? A friendly and happy place with a lot of energy? Is it a school where a principal has a strong understanding of students, staff, and community? And having all three is where the principal is actually the instructional leader who can help their teachers be better, who has strong relationship with students, but also strong strategies around different kinds of students, because students have very different learning needs. And one, I’m making sure that from my son’s perspective, are they going to be able to get to know him and understand his needs? And it can’t just be the teacher. It’s got to be the principal as well. Because as you’re thinking about moving a kid, what class were you going to put that kid in if you have multiple kindergartens and first grades and second grades? And what’s actually that path from K through five? You need to have a strong teaching core of teachers that are getting support, that work with each other and collaborate, that love kids and also take real pride in trying to. It’s a really hard job, and trying to address all different kinds of kids’ needs. And also a school with a robust curriculum, so that my son has exposure to arts and music and computer science. There are little mini coders that love computer science in elementary school. Some kind of field trips as well as really strong core curriculum. And you’d like to have a nice parent community and how do you find that? You try to look at data, and then also talk to people, right? So, I think that that’s where in the state we have some work to do in terms of, if the state wants to be a central point for parents to actually get information, which I think it can be, or at least be a role model for districts to actually be the central point, there’s work to be done there. Because it’s not easy as a parent to go and look at the dashboard and get a sense of what is that? Like, I go in there for Beethoven Elementary, it’s not the easiest thing to utilize to get there. Did you understand the California school dashboard at first glance? Or how long did it take you to figure out, and who had to help you? It’s not the most user-friendly tools for parents. I think of a dashboard, so there’s really three main purposes for what I think of more of a learning system versus accountability system. One is to give parents information to be able to understand whether a school makes sense for their kid and how that school is doing and how I actually support that school. Two is getting good data in the hands of the practitioners so they can actually learn and get better at their jobs. And then three is having good data for state and districts to be able to identify what’s working and what’s not working so you can actually intervene to provide supports. And then also at times, intervene to make changes and have actual accountability. Those are really the three purposes. And I think on all three of those fronts, we have work to do with the current system. I think on the parent piece, I mean it’s interesting if you go side-by-side. You go to Greatschools.org and you look at the dashboard and you can just see the difference. Both tools aren’t perfect, but one’s a tool that’s designed to support parents, versus one that’s not, right? Because you go to Greatschools.org and they actually have little tips, so you don’t have to go to some 30-page manual. They literally have, hey, click on this clip. This is what this means. Parent tip. You don’t have to dig too deep in data. They actually have pretty user-friendly descriptions of what each thing actually means. It’s right there in an immediate click. And when you get on the California dashboard, you have to really dig to find out what’s going on in each area. That’s a challenge. It’s just not designed to be user-friendly, and then in terms of a learning tool for educators, if you don’t have relative data, how does this school actually perform compared to other schools with similar demographics? And how do you know where you actually can improve? If the state isn’t leading on this, then the districts will. And I think now that what the state should then be doing is finding out what districts are using. Let’s actually see different districts that maybe have different systems, and let’s have the do-it-yourselves, how many unique people are using the information? That tells you if it’s good or not. How did your parents pick a school for you? So, our journey was K-5 Catholic for me. I was raised in a pretty Catholic-influenced household. I was born in Burlingame, California, a suburb of San Francisco. Then we moved to a neighborhood that had a phenomenal middle school to Hillsborough. And that school was much better than the Catholic school, so my Mom who was big on religion was like, I’m big around school. My mom was a teacher. My aunt was a teacher. My grandma was a teacher. My education was very much in our family. My sister did the first test year at the school. My mom was like, “Wow, that’s a much better school.” And so then she moved, and then my brother and I went over. Four. I’m youngest of four. All one year apart. So, I did middle school public. And then I had the option of either public high or Catholic high, and I chose public high. … I was raised in a family with a lot of love. I had two parents and three siblings and we all got along and I was very lucky. What makes for a successful school? When we were doing our school turnaround work, our schools that had the most success, all were high poverty. All were our lowest 5 percent at the Partnership, but the schools that are the most successful were the ones where you had a good, strong core of teachers already. Maybe the administration wasn’t where it needed to be, and you’re able to get that alignment. And the schools that have it the toughest are the ones where you’re just not able to get that high quality, consistent instruction. You never get high-quality, consistent instruction without strong school leadership. The two just go hand in hand. And too often, in education that’s not the primary focus, right? That’s where a governing structure matters, but I think one of the reasons that some of the charters, particularly independent charters, but in general actually even in affiliates, a lot of the early ones had that strong culture, and actually the teachers and the principals wanted flexibility from the bureaucracy. And so that’s what led to the first round of conversion charters. And then you saw more and more charters pushing in neighborhoods where the schools just weren’t doing well at all and the ones that are better, because they’re building new teams. They’re able to build those kinds of cultures out of the gates. And so, it’s not just the governing structure that makes such a good school. It’s actually the combination of the people and then the system they have. They keep reinforcing supporting the adults on a campus whose then job it is to support the kids. And then you combine that with some strong curriculum and then supports. But the people, that’s the key. And then too often, we don’t invest in developing, you just have to invest in your teachers, your principals, your counselors and in your office staff and others. But really starting with your teachers, principals, counselors. And too often, people focus on programs or other variables that certainly matter. But it’s easier to change out a curriculum than it is to build capacity and change people’s practices. And too often, that’s not the focus. In the best schools system, like look at Long Beach, if they have very, very strong systems for developing and supporting their teachers and developing and supporting their principals and their assistant principals. They have really strong integration between Cal State Long Beach and the school districts so that the new teachers coming in when they’re taught at the university, they’re taught with similar language and similar philosophies that they’re going to actually get in practice at Cal State Long Beach. Our highest-poverty students and our neediest students have less experienced teachers and principals with greater turnover. And until that fundamental problem is actually addressed, you will not see major gains in achievement. So, I always kind of think about what we did in our schools. We paid principals more to work in East L.A., in South L.A. and Watts. Even though they’re district schools, we leverage philanthropic dollars to actually pay administrators more to be on our campus. We also pay to have additional, for certain schools, assistant principal support. You think about how do you get people to come and stay in a job? You have to be able to compensate them well and then give them conditions for success. And so in addition to paying principals more, we actually had a much higher ratio of directors to principals in the district, so that our principals actually had a coach about a half a day a week. Which is unheard of. And in a district, the ratio of directors to principals is like 30 to one, which, you don’t get any coaching or support there. You basically get checked in on once in a while. And so, with this deep turnaround work, so we’re not only paying principals more, we gave them more autonomy to leave, which is what people like. Good leaders like to have more flexibility. They don’t want to get constrained by bureaucracy. And although we still have to follow the Ed Code, we have flexibility from the district rules. And then we also gave them more support. We also were able to leverage some additional dollars to find your more effective teachers, and then we gave them additional dollars to be coaches and mentors to their peers. And then you’re also going to adjust your master schedule. Find your most effective educators and give them stipends to support their peers. We really anchored on a peer-to-peer learning model. So, we get together with our principals once a month, we look at data, and then we find like, “Hey, which school is doing the best with English learners?” And then they’d all go to visit that school and walk together to see what changes that they made. It’s a similar concept with your teachers. Find your most effective teachers. Give them some time in their master’s schedule so they’re not always teaching kids, and have them go and coach and mentor their peers. When you think about statewide, you want to have actually district to district, and county-to-county learning where you find places like Long Beach that have made much more success, find out why they’ve done that, give them some additional resources to free up some people to go and coach other school districts. With the Core Districts, they started doing this a couple of years ago where Long Beach was giving supports to Fresno. This is what you want the state to do, you don’t want a state to require all these things, you want a state to kind of leverage data to find out which districts are doing really well and which districts are really struggling, and then you match districts that are doing well, and not just match them, you give them additional resources because collaboration takes time. If you just ask someone to partner with somebody else and give them no additional resources, it’s not going to happen. So, you give Long Beach some resources to grow and help a district that’s struggling with English learners, or that’s struggling with ninth grade math. And that’s what the state should be phenomenal at, and the California Department of Education should be all about a phenomenal learning organization. Find out practices in the field that are working for certain subgroups of kids in certain demographics, and then share those practices with other districts, and don’t necessarily have the bureaucracy do all that sharing. Activate those in the field to build the capacity of each other. Shift the whole California Department of Education from being really heavy compliance and regulation to much more service and support. And what a lot of people forget about this position, people are like, “Oh, the position doesn’t have much power.” This position is largely an administrative position. It actually manages a 2,500-person organization called the California Department of Education. It’s a $350 million budget. It’s supposed to be focused on serving and supporting school districts. That’s not all the job, but it’s a big part of the job. And it’s the reason the job in many states is appointed and not elected, because it’s part policy, influencing the governor and the legislature on policy. We could talk more about that. And it also sits in a bunch of different boards where it has some direct policy-making authority. But a big chunk of the work is actually how does the state serve and support districts? And that’s not the way it works right now. It’s very heavy compliance and regulation. I want to shift that to service and support. Another small example, but something you can do really quickly and we’re going to do is, the state identifies teachers of the year and principals of the year and administrators of the year. And you usually get a certificate and a picture. And I say let’s give them $10,000 each and have them go online and twice a month go a Google Hangout where they share what they’re doing in their schools. So, if you are a ninth-grade algebra teacher, you know that twice a month a number of the more effective teachers in the state are actually sharing how they have moved the needle with English learners in the classroom. How they actually leverage inclusion on special ed. What shifts do they do in their lesson plans, in their uni plans? How do they make adjustments? You want to have peer-to-peers, and the state could literally do, and with technology, you don’t have to fly to a conference. You can do this stuff online. How do you increase parent engagement? In the Partnership schools, we dramatically improved parent engagement. What did we do? First, we put more money into it. So, we actually raised money. We raised about $10 million. About $700 per kid. And we put a decent chunk of that into parent engagement. We have made sure that our schools have parent coordinators at the school site. We renovated parent centers in every single school and made sure they were close and accessible, not like the last bungalow the furthest away. We launched a parent college on Saturday. So once a month, 9 a.m. to 1 p.m., we invite our parents — average educational level was eighth-grade, a lot of new immigrants, a lot of multi-generational poverty, but just wonderful parents who love their kids. And so we help them get more in their kids’ education. And we also build parent engagement into the evaluations of our principals. And I always tell people if you want something done at scale from an implementation perspective in schools, find out if the principal’s being evaluated for it or not. And if they are, then you’ll see much more consistency. And if they’re not, then you’ll see high variability. We had awards every year where we recognized the school that was doing the very best on parent engagement. And then we had teams, usually an assistant principal, a coordinator, a couple of lead teachers on parent engagement. And you can think about stipends for the teachers as a way to integrate them. So, like that’s how a school system changes parent engagement, and whether, not to downplay it but, there’s been plenty of policies that say you have to include parents. ESSA is not the first. It just comes down to are you actually shifting a school system in terms of practices, personnel, incentives, and accountability to actually prioritize that? And then, are you doing a really good job of sharing quality practices? And kind of like I’ve said at a state level in the Partnership, like Mendez, which just did phenomenal. They took such pride, they won the parent engagement like three years in a row. And then the other schools would want to learn from Mendez, and that’s so you’re identifying what’s working. And that’s how you move parent engagement. And I think when you do that at the school level and you have more people engaged, then I think your next step around getting people more engaged in policy becomes better. Like in our parent college we had two tracks: We had the academic track and the empowerment track. And the academic track was about how to better help support your kids in school. The empowerment track was here’s how your child can get into a community college or a Cal State. It’s like getting that information both for their power and also be advocates for their kids outside of just the classroom. You’ll see over time, more engaged parents usually equals more movement on student achievement. And then how do you help districts? A lot of times districts just don’t know how to reach parents. Like in our schools, it wasn’t like people didn’t want parents engaged. Like some folks, they just accepted this idea of, oh well, parents don’t engage. No. They do engage, it’s just that you may have to work differently or harder because a lot of parents are new to this country. Where they came from may not have parent engagement. A lot of parents that are multi-generational poverty in the same neighborhood, they may have had a bad experience, and probably had a bad experience with school. So, you got to bring them back a little bit. But you do the work, you went door to door, invited parents to come to the parent college. It requires time, energy and resources. In the end result, we have 7,000 parents have gone through the parent college and the Partnership to date, and it’s still big and growing. And then I think that then you can kind of push into, you don’t have to do it sequentially, you can parallel, you can educate parents on policy. But if you have your parents more engaged in their kids’ school, that’s like step one. And then step two is OK, now how do you get parents more engaged in helping other kids’ schools? California test scores are flat. What would you undo at the state level, and what would you do differently that’s already been tried? As we’re sitting here, 6.2 million kids in public schools in California, and over half of them can’t read and write at grade level. In the wealthiest state in the nation, in the most competitive economy of humankind, where low-skilled jobs pay poverty wages today, and tomorrow, those jobs will be gone, it’s never been more important as a society to be literate, to have strong critical thinking skills, to have strong collaboration skills, and to have strong communication skills, to be able to be a really good ongoing learner. It’s never in the history of humankind been more important to have those skills. And we have half of our kids can’t read and write at grade level. As you know, we’re the technology capital of the world in this state, home of the Silicon Valley, we’re the creative capital of the world, our fourth-graders rank dead last in science on the national test. So, we’ve got a huge problem, and getting back to, what do we change? We need real change in our public schools. We need to fundamentally shift the status quo. It’s going to take a decade at least, because we’ve neglected our schools for a very long time, and frankly this state has not prioritized public education the way it really needs to be done. And if you look at it both in terms of funding decisions and also policy decisions, we just haven’t prioritized our schools. There’s no other way, there’s no other rational explanation for why California public schools are performing so low except for the fact that we haven’t chosen to make them really, really good. We’ve got a plan that folks can take a look at online and we lay it all out in much more detail. But it starts with: public education has to be the top policy priority for the state of California for a decade. And governor, state superintendent, and legislature have to actually make it the top priority. If not the number one, then number two. But for a decade, it’s got to be one or two for a decade, if we want to get to where we should be, which is a quality public school for all kids. What state has done that? And they passed legislation that I think it was over eight years, dramatically increased their funding. So they focused on funding. They dramatically increased their rigor. This is back in ’92, ’93, well before, not just Common Core, but strong standards for most states. They pushed on accountability, they put testing in relatively early to see where schools were at. They pushed on flexibility, so not as much with charters, but with pilot schools and some different school models. And then heavily invested in personnel like teachers and principals. So it’s not rocket science, but they did it, and they stuck with it. They really just dramatically increased the priority in public schools, and they’ve stuck with it. And as you can imagine, education, there’s always pushback. And it’s not that people are bad people, it’s just some people are really tied into the current system. So when they increase the rigor of their standards, they had a lot of pushback, but they hung in there. Even the best change possible still has pushback because people in general, not just education, just in general, there’s a natural resistance from many people to doing things differently. So, that’s a really interesting model. Now they’re the best state in the nation across the board in these things, and they still have work to do on closing the gaps. I think a quarter of this job is high-quality staff for the governor and the legislature to help them put in place a policy environment that actually makes sense for practitioners and kids, rather than just have an Assembly member have their one-off bill, and the senator had their one-off bill. You want to have a 10-year plan for schools, and then every year update your policy agenda. And then, within that, where do you start? And we think the four key areas for really making our schools from where they are to being among the best in the country is phenomenal investment in support of teachers and principals, and by extension that includes counselors. But that’s where you have to start. Moving our schools in the 21st Century. Fully funding our public schools, eventually serving all kids, which gets to some of these big equity pieces. And within that, we have a number of different strategies because there’s no silver bullet. You actually have to do a lot of each area, and you can’t do it all at once. That’s the mistake that happens too often. I made this mistake when I first started to work in the Partnership schools where the first year, there was a need that we tried to solve all these problems at once. And the problem is, you just can’t make enough progress. And again, it’s chaotic for the folks in the field. So, we’re going to get to all these things over time, but let’s actually pick what matters most, like high-quality school leadership, invest in our teachers and parent engagement. What would you undo at the state level around student achievement? What would you do differently that’s not already been tried? We’re going to adjust the interpretation on LCFF, which you can do in this job. We’re going to keep LCFF in place. LCFF I think is probably the most important policy in education in California for at least a decade. I think both giving more money to high-poverty kids is absolutely essential. And then giving more flexibility to practitioners to use that money makes a lot of sense. But we’re going to undo around LCFF the interpretation to allow school districts to have that money, not the kids, and really use that money for across-the-board raises rather than raises that are differentiated based on who’s actually serving high-need kids. And so we’re going to make sure that districts are transparent about where do they spend the money, and we’re going to be clear that they actually have to spend the money on the kids in greatest need. And that was an interpretation from the current state superintendent that has really led to the reallocation of significant amounts of dollars. And unless you actually differentiate the dollars to the highest-poverty kids, you won’t get to that point where you’re able to get that stable staff that’s going to be there for a long time and the additional counsel and supports that are essential in order to address the social-emotional needs in addition to the academic needs for kids. You have to give the practitioners close to the work the decision-making. But, we’re going to require the money has to go to the kids of highest need. That has to happen. So, that’s a big thing that we’ll change. Secondly is giving districts much more flexibility in the education code. So, you talk about things that have been built up that need to go away. A significant portion of the education code has been built up over the last four decades and needs to go away. Charters have flexibility from most of the education code, not all of it. You need some. Obviously, we need some parts of that education code around civil rights, around making sure what kids are actually learning, around accountability, around ensuring that there’s actually no discrimination. So all the state around safety, those are essential. But a lot of areas around time and curriculum and where the state’s dictating how to do the work in the field, that needs to change. If you look at a California Education Code, it’s 2,500 pages. It’s probably six-point font. I mean, it’s this massive document that takes creativity and innovation out of the hands of teachers and principals. And charters didn’t have flexibility for a long time and district schools should have flexibility from it as well. And so, the legislature has to actually lock in, they have to get rid of the laws, and that’s tough to do politically. The state Board of Education can get waivers to most of the education code, and the state superintendent staffs the state board. So, what I want to do in the first year is get a number of superintendents from up and down the state to come together and ask for one larger waiver through the state board, get a three- to four-year waiver, show what’s possible with flexibility. And then when you’ve shown that this is working better for kids, then go back to the legislature which has tougher politics in order to get that flexibility. So, you have that deep, deep flexibility. So, when you talk about kind of our foundational plan which answers these questions, it’s when we’ve built way too much bureaucracy and regulation, which really hurts innovation through the education code. So, let’s decrease that significantly. We’re not serving all kids, so let’s really support LCFF and make sure that stays in place. Because I think, again, some folks might push to have more guided targeted dollars. But let’s make sure that that money is actually getting to the kids. That sits in the power of the state superintendent. On the teacher and principals side, there is some stuff that I can’t do and some stuff I can influence. The teacher shortage is a massive problem. And you think about the things the state hasn’t done, the state has not really addressed this issue with any real scale. Long-term, we have to pay teachers more. It’s absolutely essential to get people to come and stay in this profession. You can’t have a profession that two people in their 30s work in it and can’t buy a house in many cities somewhere near where they teach. That’s not viable. Most countries that are doing the very best in education, there’s a much tighter band on how much people can make between teachers and lawyers and engineers. In this country, it’s a massive gap. So, you got to shift that. That’s going to take time, because that requires real dollars longer term. Short term is, I say, free college if you commit to teach five years or more. That’s not that expensive of a piece of work, and you do no-interest loans, and if someone teaches for five years, those loans get waived entirely. And if you don’t have enough money to pay for all of it, you can start with doing that for high-poverty schools in high-need positions, and then I think over time, expand into all teachers trying to get them into the work. In parallel, we’ve got to change the teacher training programs. And so, the state sometimes does sit on the board of trustees for Cal States, and the regents for U.C. and the majority of our teachers are taught in the Cal States, some in U.C., some in private. But our student population has changed dramatically. What we know about how kids learn has changed dramatically. What we know about pedagogy and kind of different teaching practices has changed dramatically. But our teacher training programs haven’t changed dramatically in scale. And so, I’d like to see us move most of the curriculum into undergrad, and that fifth year being mostly a residency year where you’re actually working and learning it from a high-quality teacher. So that my 6-year-old son or 8-year-old son in a couple of years has a brand new teacher. That teachers actually learn from somebody for a while. That’s actually a no-cost change, because they pay for the fifth year anyway. It’s just a matter of actually changing structure. And then we got to adjust and improve what we’re training our teachers on in parallel. So, that’s got to change. We still have some work rules that don’t make sense that have to change. That’s part of the ed code. You can’t get waivers in those. You’ve got to work those through the legislature. But a two-year tenure is too short. Seniority shouldn’t be the only factor for for layoffs. That was a part of the lawsuit back in 2009 we launched in the Partnership schools, because the neediest kids have the youngest teachers. And so, if seniority is the only factor for layoffs, it disproportionately hurts the kids in greatest need, who have the greatest need for the most effective teachers. Let’s talk about English learners. Only 9 percent were proficient at state levels. You’ve got more than a quarter of all California students classified as English learners. What do you tell their parents about how you help their kids achieve? We know that our English learners are on a journey is a little bit harder because they’re having to learn both language and core subjects. But they’re wonderful kids. They’re incredibly smart. They’re the same kids as other kids, right? They just have some language differences on the way in, and the majority of schools that I’ve led have significant numbers of English learner students, and so I’ve dealt with a number of students that are at Yale and had a real progress there. And it gets back to some of the fundamentals we talked about throughout the conversations, which is, one, you have to make sure that you have highly effective teachers teaching English learners because it’s a harder job. And we don’t proactively encourage, incentivize teachers to go in and do that. You have to ensure you’re getting good instruction there. That gets back to having the LCFF dollars that you get for all the kids. So, you can either increase compensation or decrease class size, but make adjustments on supports. It gets back to what we talked about in terms of our teacher training programs. So, over 20 percent of our kids are English learners, so you go back and like how much time are we actually spending training teachers on English learners? Across the board, it’s actually not a lot. It’s nowhere near the 20 percent it’s commensurable to kids. So, we have to actually adjust the training in our teacher training programs that are actually happening, increase their skills for serving EL students. You also got to go back and probably do some retraining with principals and even district directors, because as the student population has gotten a lot more higher poverty, a lot more English learners, some folks who have been around for a while haven’t necessarily learned the strategies on how to best support them. And so, you have to make those adjustments. Certainly what’s nice is with Prop. 58, there’s going to be more access to bilingual education, which is a helpful thing. It gets back to what we’ve always talked about, you have to have teachers who are able to teach bilingual. And principals that can support it. And then the parent engagement piece we talked about is critical. So, you can actually run parent engagement tracks for parents of English learners. Our parent college had some classes in Spanish, some in English depending on people’s base language. And then you also have to extend time. Like, by definition, if I’m having to learn math and a language, it just might take more time. And so, in our schools we did zero period, extended periods. Because we have to look at after-school in summer, that we’ve just totally defunded and under-invested in. Because it’s just a little bit of a harder and longer journey, because you’re having both the academics and the language at the same time. You need to have really quality instruction and school leadership. You have that extended time. You actually have to have more, your curriculum’s got to make sense, as we’re moving to some bilingual, which is positive. And then you also have to have strong data to see how our English learners students are doing. What the state should be doing is identifying school districts that have large EL populations today, and which ones are doing better, and what have they changed? Is it time? Is it personnel? Is it curriculum? Let’s go to low-performing schools. Parents in 300 to 400 schools are going to find their school is on a list of state’s lowest performers this year. What kind of assistance would you tell these parents that they can actually witness at their school during the time their kid is at the school? We’re going to shift LCFF dollars and make sure they go to the kids of greatest need. There’ll be additional resources. And that’s something we’re going to move to quickly, and I have authority to do that. Secondly, we’re going to bring in additional people to help your school and your school district have more success. And this is where whether you work within the district, and finding a school that’s actually had more success to go and coach and mentor and build capacity at a low-performance school, or across districts, that’s where the state will work with a district or otherwise. But you have to actually bring in additional interventions and supports to help get that done. You have to build the capacity of the professionals. You probably have to extend time, or, so if a school is really struggling, the kids are struggling, if you’re building up the capacity of the professionals that are there, you also probably got to extend some time to have your kid catch up because your kid’s behind. That’s a lot of what we try to do in our schools is whether it be with, again extending school time, zero period, seventh period, actually providing some creative courses outside the realm of the school, community college can actually catch up is what you have to get done. Third is, we’re going to get you more involved. You’re going to be a part of the solution. And so, this is where, again, I think the state is pushing interventions. How do you get parents and community more engaged into the work in our lowest-performing schools? And it’s essential. And then fourth, you have to increase staff. Not necessarily just increase staff, not necessarily just for class size. You’d address class size if you can. It depends on how much money you have and what your trade-offs are. But you also want to increase psychologists and counselors on certain campuses. Partnership is an example of really what’s coming here, which is it was all around lowest five percent schools just in L.A.
You have to have school leadership that can actually move the needle dramatically on the schools. We want to actually include those parents and where we’re going to go. And then you sit down with a different strategy we talked about. You can’t do them all, like I said before, you don’t do them all in the first year, but you sit down and figure out how to let’s get a strong school year in place. Let’s figure out do we want to extend time? Do we actually want to bring in more psychologists? Do we actually, no matter what your investment in building the capacity of your teachers and counselors that are there, probably invest, most low-performance schools have high turnover, so you really want to invest in high-quality recruitment so that when you are filling positions, you’re filling people with really, really strong people and that’s again, we’re getting back to differentiated supports and differentiated compensation is essential. It’s not you have better test scores, you get more money. It’s like hey, like at Jordan High School when we started working there, we gave signing bonuses for people to come work at Jordan. Because it’s the only way they would come to work there. That helps you get more people to come and then as long as when they get there, they have more support as the teacher with counseling and coaching and mentoring as well as having more counseling supports and other supports here as a teacher. You don’t have to be the teacher plus the counselor plus the security guard plus the parent coordinator. Let’s talk about bankruptcy. The next four years could very well find school districts falling into bankruptcy because of pension and healthcare liabilities. What can you do as a superintendent to change that, and how would you prepare parents and teachers for what you can’t forestall? So, step one is the superintendent sits on CalSTRS, and, I think, over the last four years, should have been the loudest voice to the public, to STRS, to lawmakers that we have a crisis in terms of the growing liabilities. And that hasn’t happened, right? I mean, this is an issue that leadership has not really put forward. And so, first and foremost is, I’ll be very, very active with governor and legislature, with parents and public on: we have a big crisis. And not just by saying that, but actually showing what, if you talk to any superintendent, their number one, if not number one, number two issue right now is the growing liabilities. And so, and the public doesn’t see what those are. So, if we have consistent financial reporting where you have to see where is money actually going, then parents will see a large percentage is actually going to pay for liabilities, and then that at least forces the conversation to get out there. Now what you need is you need the governor and the state supe and the legislature working with labor and others to say, OK, we actually have to address this issue. What are the different variables that are available to address? There’s no easy solution. The state has allowed this to, I think it’s been almost 20 years where we’ve allowed it to get bigger and bigger and bigger. And then some districts like L.A., not as many in California as some might think, but there’s still some districts that actually have lifetime health benefits, which compounds the problem. Most districts got off of that in terms of for full families. But many still have it. And so, you have to put that information forward and then sit down and look at the really hard problems of how do you solve this issue? Because right now it’s not being solved, and that is hurting kids because it’s actually increasing class size and decreasing quality of programs. What if you win but the candidate you might favor for governor doesn’t win? What can you do if their goals and your goals clash, which of your top goals would you fight for the hardest? And what are your best strategies for compromise and collaboration? I’ve been very clear with the candidates for governor that whoever wins, I’m working with them to improve our schools. And as I mentioned briefly, I feel like a big part of this job is to help get the governor and legislative leadership to prioritize school more, and give them some political wins. And on the tough issues, keep them out of it and take the heat. So, I don’t anticipate clashing. I think my record and the Partnership and also the new teacher center where I worked most recently between elections, working with a lot of different people, of certainly having some challenges, but always working through them, is essential. And so, whoever wins the election, I’m working with them. And if there’s less alignment, then there’s just more work to be done going forward. As I mentioned earlier, there’s a lot of things that are in the state superintendent’s job that don’t require engagement from a governor and a legislature. We won’t have the best public schools in the country in a decade unless the governor and legislature are fully in. But things like getting LCFF dollars to follow the kids. Things like having phenomenal best practices being shared across school districts with the state actually supporting that. Things like working with districts to get more transparency in terms of where money’s currently going today so we can see what’s going on. Things like sitting on CalSTRS because I sit in that new position and in trying to push the conversation forward on the liabilities. Things like getting more flexibility through the state Board of Education. Those are areas where you can make progress even if you’re stuck with the politics. Now, big issues like paying teachers more, free college for teachers, pre-K for all which I mentioned at the high level, we talked about moving our schools in the 21st Century. It starts with when they begin. You cut the incarceration budget by 10 percent, you can pay for pre-K for all. And that’s a political decision that we should just make. So, those bigger issues, integrating health and human services with K 12, which they should be much more deeply integrated. In our schools, we’re able to get some health clinics, leveraging county money get some health clinics onto our campuses. You can’t really get that done well without the governor. So you need to move the needle for all kids as much as possible, you need a governor to lead on this thing. But we got eight years together, assuming that you win and you win in re-election, and that’s where year one, let’s focus on things that everyone agrees on. I don’t know if there’s a person in education who doesn’t think that we should have pre-K for all. And I think my voice can come and help with priorities. Hey, I’m a big believer in that we need to have college be highly affordable? Absolutely. But step one, do I make sure we have pre-K for all kids so they have a change to get there? Yeah. But you can, year one, put some issues forward: pre-K for all. Free college for teachers. More flexibility for educators. You got to work with labor on that. But flexibility on curriculum and time, that’s stuff that everyone can get around. Let’s work on those together in the first year, get some good stuff done, get some wind and build some trust, and then you take on the stuff that’s more complicated. And then challenge often in education, we spend so much time on the areas of disagreement. Charter, district, tenure to tenure, that we don’t spend time on the 85 percent of the areas that most people agree. What’s one innovative or transformative initiative that you would make sure gets done on your tenure? Much more flexibility from the education code, because that unlocks innovation for all the educators in the field. I mean, this job is not only just about direct doing, it’s how do you actually enable those in the field to do much, much more. That’s the way you unlock innovation. What’s the one innovation you see happening in California or another state that you would amplify at schools statewide? Some districts have moved faster on, and in districts and in university systems, on better teacher training programs on teacher residencies. To actually give teachers much more work in the field. And then in terms of innovation, I think you’re just seeing some more pockets in districts are related, but a lot more school redesign, like where you’re just giving education to redesign their schools. Should parents have a vote in school-related contracts negotiated by the state and school districts? That’s a complicated question. I don’t think so. I think parents in the school board elections and making sure you have the right superintendent and the right leadership. Contract negotiations are pretty complicated, and so unless someone was really digging into details on a regular basis, you can see some unintended consequences there. I would want to learn more. None of the candidates has run a large school system. How does your experience prepare you to be state superintendent? Well, I have. You look at me compared to my opponents, I’m the only person who’s actually led school systems or led large organizations. So the Partnership, 15,000 kids, 18 schools, I mean it’s in the top 10 percent size of a school district in the state of California. I’ve actually led large school systems, more importantly, I’ve not just led them, I helped open 10 schools, eight of 10 recognized by U.S. News and World Report among the better schools in the country. Partnership had the highest improvement on the API of any school system of more than 10,000 kids. Graduates with 36 percent, 81 percent. Neither one of my opponents has actually had significant leadership experience in schools, particularly in implementation role. We have a comprehensive plan online, so you can see a lot more details on each of those areas. Year one, you want to get governor, governor rep, legislature, labor, parent reps, civil rights, state supe to actually put together an actual ten-year plan. That’s a foundation. That’s like a starting point. And then you really want to go deep on the first three years. Like, what are we going to get done? And by doing that process, you get a better sense of the questions you’re asking. What does everyone actually agree on and what don’t we agree on? And my experience has been we start especially when there’s some past lack of trust. Projects in that first year we all agree on, there’s so much work to do that you can take a year off of high disagreement stuff without losing a whole lot. And even like within a charter role, it doesn’t mean you don’t do charters. Everybody agrees: more transparency for charters, shut down less-effective charters. So you can do that stuff even in the first year. And then you take on some of the more challenging stuff later. *This article has been updated to add that Tuck is a Democrat and that he was at the New Teacher Center from 2015 to 2017.